Ready to understand your money like never before?? This step-by-step guide will help you get your money organized, TODAY! Even better, it comes with a FREE Money Organizer spreadsheet! Jump in and enjoy, I think you’re gonna love it! I’m going to show you how to organize your money. A lot of people I’ve talked to believe personal finance is a just a budget and investing. No, there is way more to personal finances and money than that. I graduated with a bachelor degree in accounting… Yes, I’m that kind of guy. I had to learn all about business finances in college. This may be boring, but just give me a few sentences to explain this. To run a business there are 2 main financial reports you have to have to understand to really know the finances of the business and make decisions. They are the balance statement and the income statement. That may sound like a bunch of business jargon totally unrelated to personal finances, but they are very similar. Personal finances work the same way. 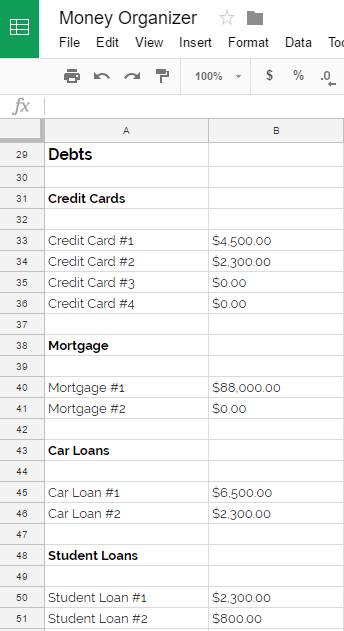 An income statement is very similar to the typical budget in personal finance and the balance statement is very similar to what I call a Money Organizer. That’s what I’m going to show you how to do in this post. We’re going to create a Money Organizer just like a business creates a balance sheet. Well… It gives you an incredible understanding of your money and being aware of your money gives you control over your money. That’s how a Money Badass manages their money. It also organizes your money into a simple format that you can quickly glance over and understand your total financial picture. Best of all, I’ve got another free spreadsheet to help you follow along and do the heavy lifting for you so you can focus on your money instead of the details of how to set it up. Grab the spreadsheet below and follow along. GET ACCESS TO CHEAT SHEETS, GUIDES, CHECKLISTS, AND TEMPLATES TO HELP YOU BECOME A MONEY BADASS. Enter your email below to get instant access to the bundle including the spreadsheet used in this blog post! If you've been following along, you've probably already completed the Money Discovery from the previous post. If not I’ll recap the parts you will need to complete to fill out your Money Organizer below. First up is your bank accounts. Think of all your bank accounts. Let’s get a handle on everywhere you have money right now. Do you have checking accounts? Savings accounts? Joint accounts? List them out on the spreadsheet with their current balance. Sometimes people will have old accounts they haven’t checked on in a while. Try to think of any you haven’t used in a while as well. Enter all of your bank accounts into the Money Organizer spreadsheet under banks. Moving right along.. Now let’s list out all your physical assets. This is anything physical you own that has value. Lots of items you own probably have some value, but for Money Discovery purposes it’s best to focus on high priced items like your house or cars. 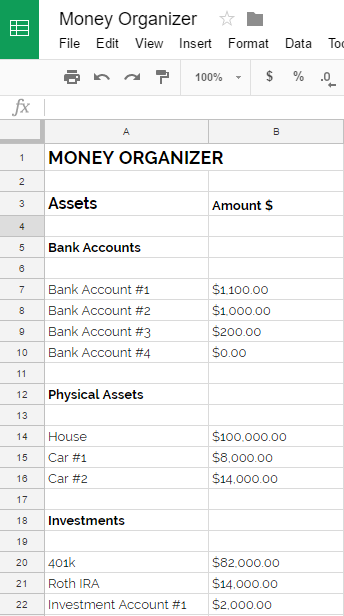 Enter these assets into the Money Organizer spreadsheet under Physical Assets along with their value. Next, take a look at your investments. Think of every investment account you have. If you’ve worked at several companies over the years do you have multiple retirement accounts? Do you have private investment accounts like a Roth IRA or Robinhood stock trading account? You may have a bunch of debt accounts or no debt accounts. If you’ve got 0, keep on moving to the next section. Congrats, by the way that’s awesome! More likely, you do have some debts though. The less the better, but most likely you are going to have some and if you’ve been ignoring that debt, it’s now time to stare it in the face and take the first step to tackling that debt full on. Pull up that spreadsheet again and fill in every debt account you can think of in the debt section. By now you’ve got a pretty full spreadsheet and your financial picture is beginning to come together. Now that you have completed your assets and debt, it’s time to figure out your Net Worth. The first thing that comes to mind for most people when they hear net worth is some rich billionaire like Warren Buffet or Donald Trump. It’s not just for rich people! You have a completed Money Organizer now! Your money is organized and you can quickly glance at it and see your financial picture. The problem is a Money Organizer shows your financial at a certain point in time. You have to keep it up. I recommend carving out 1 day per month to update your Money Organizer. Put it on your calendar and do it that day every month. I personally like to review and update my Money Organizer on the 1st of the month, every month. Duplicate your current Money Organizer and simply update it for the new month. You’ll be able to see trends over the months, like your debt decreasing and your assets increasing which will begin to raise your Net Worth. It becomes a goal you can work towards each month to slowly increase your financial picture for the better. Now go take action and create your own Money Organizer! Now it's time to make this happen. If you haven't already, download the spreadsheet and get started organizing your money! READY TO BECOME A MONEY BADASS? If you want to get really serious about managing your money. You need to check out That Badass Money Handbook series. This is an awesome step-by-step program to help you manage your money!